This is a great vintage necklace with a large gold letter! 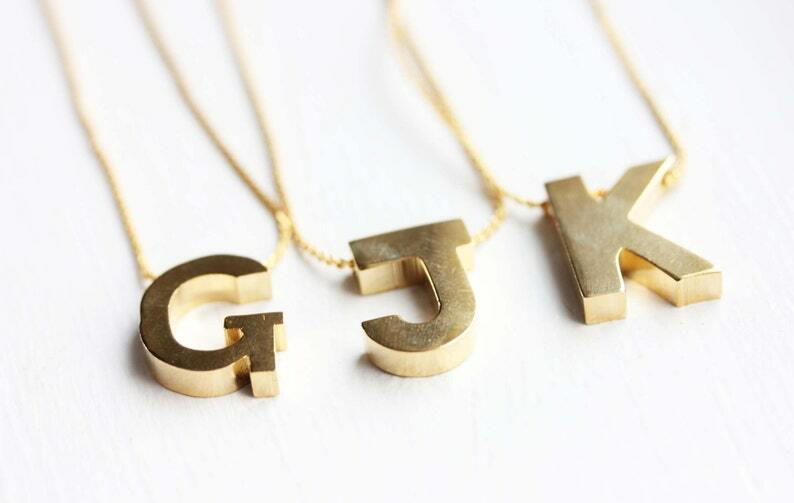 The necklaces measure 14.5" long and the letters are about 1" tall. These were made in the 70s but have never been worn! If you need an extender please make a note that you need a longer necklace. The extenders are usually 2". Please specify which letter you'd like when you place the order. These are 14k gold plated and silver plated. I will be adding more letters soon! broke out in a rash - problem with metal. We sell these ALL the time. Have sold hundreds of them. Everyone is different and people should not buy gold plated vintage jewelry if very sensitive. These are fine for 99% of people. Beautiful pin. Solid, well made, and larger than I realized. Just what I was looking for. Shipping took some time. I purchased it on the 2nd and it didn't ship out until the 17th. Thankfully it wasn't a gift, so I wasn't sweating the time at least. We accept payment through Paypal and Credit Card payments can be made directly through Etsy. I also accept Etsy gift cards. No money orders, no COD, checks and no cancellations once an order is placed. Sales Tax is charged only if you live in the state of New York. Merchandise purchased from Diament Jewelry may NOT be returned or exchanged unless merchandise is defective (see reasons for defective item). A defective item is an item that is completely broken. Plated items that fade are not defective. Vintage items that have signs of age are not defective. Gold and silver plated merchandise does fade due to the nature of it. Refunds are not issued except in the case of defective merchandise we (see reasons for defective item) are unable to replace. If we can fix the defective item or replace the item we will NOT refund you. Vintage jewelry will not be perfect and there will always be some defects. All returns on damaged products that have been approved as defective (and if we don't have a replacement) must be made within 30 days from delivery date in the US and within 45 days from the ship date for international orders. If a return is approved (only when merchandise is defective or wrong item is shipped an can't be replaced by us), you must return the order before receiving the refund. Defective Merchandise includes: broken chains, defective chains, defective clasps, broken wire, broken earring post, and several more that we will review on a case by case basis. We have the right to determine if an item is defective. Keep in mind that gold plated jewelry that fades is NOT defective, nor is vintage jewelry that has signs of age. All sales are final. There are NO cancellations permitted. We will not do cancellations for any reason so please make sure that you ask all questions before making a purchase. Orders that are lost in the mail will NOT be refunded when they show as delivered (only with tracking proof). Proof of delivery is final. We do NOT offer exchanges under any circumstance. We are a small business and CANNOT offer exchanges at this time. We ship all orders within 7 business days, a lot of times sooner. There are rare occasions where orders will be held up due to various reasons and could ship after the 7 business days, but will still deliver within 14 business days. The standard shipping method is first class mail, which usually takes 3-5 business days (after the order ships from our location, not the "marked ship date on Etsy") in the US and about 1 week for Canada. Most orders ship within 2-5 days, but can take longer. Orders will typically arrive within 10-14 business days in the US. We now have an upgraded shipping option. In the US we offer upgraded priority shipping. For that option orders will be delivered within 4-5 business days but aren't guaranteed, but we will absolutely try our best. We also have overnight shipping that will be delivered within 1 business day if ordered by 12PM EST the day prior. We also can not guarantee delivery but we will try our best to rush the order out. Please note that these times are business days as we don't work on the weekends. So if you order on a Friday, Saturday, or Sunday the order will be delayed until Monday. We can provide tracking most of the time, however we don't send it out on orders because we are such a small company and it can take a lot of time with all of the orders we receive. Feel free to reach out if you'd like some tracking! International shipping can take anywhere from 1-2 weeks from the ship date using first class mail. The total delivery time for International orders is about 2-3 weeks. Items shipped internationally can get stuck in customs and can sometimes take up to about 6 weeks to deliver. We now offer express international shipping, but it is very expensive and takes about one week to deliver. It will come with tracking if express is chosen. We also can not guarantee delivery but we will try our best to rush the order out. Please note that these times are business days as we don't work on the weekends. So if you order on a Friday, Saturday, or Sunday the order will be delayed until Monday. Tracking: In my experience, first class mail works very reliably. We can provide tracking sometimes, however we don't send it out on orders because we are such a small company and it can take a lot of time with all of the orders we receive. SHIPPING RESTRICTIONS: We have problems shipping to several countries including: Italy, Mexico and all of South America, Turkey, Malaysia, India, Indonesia. Order at your own risk! We are happy to ship to you however we can't be held liable if the package is lost. For wholesale inquiries please contact me directly at diamentdesigns@gmail.com. Line sheets may be provided upon request. Please provide store info (website address, physical address, email address, contact info) upon request. Q. Are your pieces vintage or handmade? A: Both. Some pieces are completely handmade while some are completely vintage. Some pieces are are a mixture of both, for example, many of the small charm necklaces are vintage charms with new chains. Q: Why do you have so many of the same items if they are vintage? A: Many of the items in my store come from old warehouses of unused vintage inventory. Sometimes I find as many as about 100 of the same item. Q: Are the name bracelets customizable? A: Name bracelets are not customizable because they at vintage from the 60s and no longer in production. I only have the names in the store. Q: Can I get the item gift wrapped? A: Yes. Gift boxes can be provided upon request. Many orders are already shipped with a gift box. Q: Do you sell to Urban Outfitters? A: Yes! I have been working with Urban Outfitters for more than 3 years. Q: I saw something that sold out. Can I still purchase it? A: Please message us if there is something you are looking for that sold out. We often can find it or make it again. A: No you may not unfortunately. There are no cancellations. Once the order has been paid for it is final. Please ask any questions before ordering. Q: May I return or exchange my order? A: No. Please see our full return policy in our shop policies section. Q: My order is taking longer than expected, what should I do? A: Please message me or email me directly, we will respond within approximately 2 days. We don't work on the weekend so if it's on a weekend, we will respond on Monday typically. Q: My gold (silver) plated jewelry has faded, is this normal? A: Yes, gold plating does fade with use. Things such as water, the chemical makeup of the skin, oils, and many other things can add to fading of jewelry. There is just not much that can be done other than to buy pure gold (which usually starts at about $100). I wish there is more that we can do but it's just the nature of it! Q: I have allergies to gold plated and silver plated jewelry. Can I wear your jewelry? A: We advise that people with allergies, not wear gold plated or silver plated jewelry. We advise for you to wear gold fill or pure gold jewelry for a better chance of not being allergic. We do not guarantee that those will be ok with your skin. If you are unsure of your condition, we ask that you don't order please as we don't do refunds or exchanges.